From a new fire support base deep in the Boi Loi Woods, the "Golden Dragons" initiated Operation "Barking Sands" in the middle of May. From this and other bases, search and destroy operations are being conducted in the local areas which were known to be heavily infested with Viet Cong. These areas provided sanctuary for the enemy because of the heavy bush, marsh, and elephant grass. In addition, the enemy was well entrenched with many tunnels and fortified bunkers. Through the combined efforts of the 1st Bde line companies, 7th Bn, 11th Arty, 2nd Bn, 34th Armor, Air Force and local Vietnamese units, VC are being harassed, demoralized, and rapidly losing ground. The fighting has been exhausting and difficult. The enemy has suffered severely. Recently 51 VC possible were reported as a result of air strikes in support of an infantry assault. Several ambushes have netted VC tax collecting patrols. Enemy lines of communication have been broken because of the constant daytime clearing missions. Many MEDCAPs have been conducted to aid the villagers, and gain first hand intelligence information. Much ammunition has been captured as well as Russian assault rifles and Chinese Communist anti-tank weapons. Three heavily armed sampans were sunk. The fight has forced the Viet Cong to be constantly on the move with no rest. This has resulted in freeing the people from the grasp of the VC. The 2nd Bde Civil Affairs section and the 1st Bn (Mech), 5th Inf recently processed more than 800 Vietnamese civilians through a "County Fair" operation in a single village seal and search. Brigade officers called it the largest and most elaborate operation of its kind in the division this year. The event, held at Ap Tho Mo southwest of the Cu Chi base camp, was highlighted by an inspection visit by the National Defense Minister of Vietnam, GEN Cao Van Vien. Before dawn, elements of the mechanized battalion sealed off the hamlet with their armored personnel carriers and Co C swept through the area. They moved civilians to the processing site in a broad field outside the hamlet. Eight separate stations made up the "County Fair" operation. They included census and interrogation, two information posts, animal husbandry, agriculture, a cultural team, a medical care station, and food and clothing distribution points. Loudspeaker broadcasts by an ARVN team before and during the "County Fair" explained the operations and told of the benefits of the newly completed Duc Hoa-Bao Trai road. Built by the 2nd Bde and 65th Engr Bn., it is the area's first high speed route connecting the two villages. More than 200 medical patients were treated at the care station manned by brigade and battalion surgeons. Nine hundred pounds of food, clothing and reading material were distributed along with 130 special eating utensil sets. Representatives of the Vietnamese district included the district chief, assistant chief, and chief of police. The elaborate operation was part of the Brigade Operation "Kolekole" that is combining combat with Revolutionary Development goals in the Hau Nghia Province area. Operation "Kolekole," being conducted by the 25th Inf Div 2nd Bde is far more than a combat operation. The unit has four ambitious objectives that will mean a better, more secure life for the Vietnamese people of Hau Nghia Province. Kolekole is part of the "Tropic Lightning" monsoon campaign designed to beat the Viet Cong in the very season that has most favored them in the past. "Our primary objective is, of course, to destroy Viet Cong forces and organization in the entire area," explained COL Marvin D. Fuller, brigade commander. "But we also want to make sure that when Kolekole is over the progress made won't be lost." The most immediately visible phase of the unit's plan is a major upgrading of the road system. Most Hau Nghia roads had been mined, cratered and trenched by the Viet Cong. Already, the main link between Duc Hoa and Bao Trai, two major villages, is complete. The work, being done by the 65th Engr Bn, is making overland travel between villages possible again. Not only will ARVN forces be able to move swiftly throughout the province, but civilians will now be able to move local products to new markets. As a third objective, the brigade is assisting Vietnamese forces. "Buddy operations" give these units all-important experience in joint combat operations. In addition, combat outposts of Vietnamese militia units are being strengthened. The Chieu Hoi program is proving its worth to the 4th Bn (Mech), 23rd Inf, 25th Inf Div. While acting on a tip from a Hoi Chanh, the "Tomahawks" entered the Bee Don area and immediately discovered newly constructed huts. After careful inspection of the "find," a large hut was found filled with a total of 18,900 lbs of bagged polished rice. An additional 5500 lbs of loose rice were found. This was one of the largest caches found by the Mech outfit in recent months. Previously two Hoi Chanh, found near Ben Go during a buddy operation, turned over information leading to the discovery of a Viet Cong base camp. With the combined forces of the Tomahawks and 4th Bn, 9th Inf, the area was thoroughly searched, which resulted in the discovery of a cement tunnel complex and small arms cache. Evidence showed that the VC had fled their "haven" shortly before the arrival of the 25th infantrymen. Additional information given by the Hoi Chanh showed that the VC feared the powerful air strikes and the artillery of the American forces. DAU TIENG - One Viet Cong was killed by Co A, 2nd Bn (Mech), 22nd Inf, when a platoon size patrol moved up and surrounded some hootches. The action took place on Operation "Diamond Head" in War Zone C.
The patrol, led by 2LT Gregory James from Greer, S.C., was sweeping northeast of Tay Ninh city in War Zone C when they came upon a well used trail. The scout dog immediately alerted and indicated that something was a little further up the trail. With SSG Arthur W. Way of Columbus, Ga., handling the dog, "Rinnie" led the men as they swept in the direction that the trail led. When the dog again alerted he was sent to the rear and the patrol prepared for action. After going a few more yards some digging sounds were heard by the lead elements. At this time James deployed his men by moving them forward on the flanks while he crept up along the trail. The object was to surround the people who were making the noises. But, as usual, things don't always go as planned. Just at this time, a Viet Cong chose to stop digging and walk across the trail to where his food, water, and weapon were hanging on a tree. "When I saw that the Cong was going to see my point man, who was crawling forward near the trail," said James, "I shouted to charge the hootch and then aimed and shot." The patrol charged the area just in time to see another VC hightail it out the back door, leaving his weapon and personal gear. The results were one Viet Cong killed, two weapons, clothes and documents captured, and a hootch and partially dug bomb shelter destroyed. The 65th Combat Engr Bn had constructed a footbridge across the Saigon River, 32 kms north of Cu Chi. About 3 a.m. the security force heard a sampan coming up river. The people in the sampan apparently couldn't see too well. "Crunch" went the sampan as it hit the bridge. After considerable chatter the sampan backed off and tried again some 20 meters to the right. "Crunch." Again the chatter and another attempt, about 40 meters to the left. "Crunch." Apparently convinced that whatever was blocking the river was too wide to get around, the sampan and its unknown occupants went back. And as they say around here, "Sorry 'bout that." DAU TIENG - The bodies of three Vietnamese, two men and one woman, were found recently by the 3rd Bde, 4th Inf Div. The throat of each victim had been slashed by Viet Cong. Second Lieutenant Michael D. DeCamp from Cincinnati, Ohio, was leading a platoon of the 2nd Bn (Mech), 22nd Inf, on a search and clear mission when they discovered three dirt mounds similar to numerous ammunition and weapons caches found recently in the area. The men dug into the mounds. They found not weapons, but the bodies of three civilians who had recently been buried. DUC PHO - The sudden flash and sharp crack of enemy mortar explosions shattered the silence. The incoming rounds signalled the beginning of a three-hour night battle which many men of the Recon Plt and Co B of the 2nd Bn, 35th Inf, will long remember. The "Cacti" had been sweeping an area where there had been recent clashes with units of an NVA battalion. It was late afternoon when the infantrymen set up their perimeter for the night. Ambushes were set along enemy routes. At 2:30 the first mortar rounds landed and contact was made for the third time in three days. The NVA hit the Cacti with everything they had. It was estimated 100 to 150 rounds of 60mm and 82mm mortar and recoilless rifle were fired at the infantrymen. The enemy then assaulted, supported by two machine guns, attempting to penetrate the perimeter. Artillery immediately began to pound the charging enemy and was lifted only long enough for the gunships and "Spooky" to have their chance. "My platoon was on ambush when the first rounds landed," said 2LT Walter Twyford. "We moved back to the perimeter as fast as we could. The men on the perimeter were running low on ammo when we arrived after slicing through the enemy on the way in." The recon platoon, also on ambush, moved back to reinforce the perimeter. Dug in behind rice paddy dikes, the Cacti fought to hold off the furious assault by the NVA unit. The enemy charge carried them close enough to throw grenades over the paddy dikes. Gunships from the 1st of the 9th Air Cav with flawless accuracy delivered their ordnance within 20 meters of the infantrymen driving back the enemy assault. With the enemy momentum broken the Cacti swept the enemy back. Daybreak revealed a battlefield littered with bodies of NVA. A total of 30 NVA were killed and three captured. Sixteen weapons were captured including a 57mm recoilless rifle and three light machine guns. "I'm going to see the Inspector General!" You have probably heard this declaration not once, but many times in the course of your Army career. You may have even made this statement yourself. But what does the statement mean to you? What is an Inspector General? What role does he play in your life and in the United States Army? When should you take your problems to the Inspector General, and when should you take them to your unit commander? Let us take these questions one at a time, look at the answers, and see if we can obtain a good general understanding of the role of the Inspector General and the complaint and redress system available to each person in the United States Army. Your division Inspector General conducts at least one full Annual General Inspection of each company size unit, headquarters, and activity within the division during the fiscal year. A team of qualified inspectors evaluates the unit's mission performance and state of discipline, efficiency and economy and a report of its findings is provided to the commanding general so that he may evaluate the condition of individual units of his command and the entire division. Now let us deal with the question of which problems or complaints should normally be presented to your commanding officer and which should be presented to the Inspector General. Before we attempt to resolve this question, let us consider some facts. Each member of the formed services has a right to register complaints, either orally or in writing, with the inspector general at least quarterly. Service personnel are encouraged to discuss their problems or complaints FIRST with their unit commander; however, persons desiring to submit a complaint will not be required to submit to an interview by anyone prior to registering that complaint with an inspector general. An inspector general may receive and process anonymous complaints; however, the complainant cannot be notified of the results of the Inspector General's actions. Inspectors general are available to members of the services to assist them in the resolution of personal problems. These actions are referred to as "Request for Assistance", "Request for Advice", or "Request for Information", and are not considered to be complaints. Now that we have looked at some of the facts, we can better determine to whom we should present problems or complaints. Your unit commander, like every other commander of every unit of the United States Army, is charged with the responsibility of seeing to the welfare, training, and employment of all personnel in his command. He is vitally concerned with insuring that his unit accomplishes all assigned missions, and he recognizes that his unit's mission can only be accomplished through dedicated and devoted service of every individual in the unit. He knows that individuals with personal problems or grievances cannot and do not contribute their full share to the unit effort and that to resolve these problems and grievances is to improve his unit and its overall efficiency. This brings us then to the first and most important step in the Army Complaint System. Present all complaints and grievances to your unit commander first. Give him a chance to solve your problem. It will give you a better appreciation of what he can and will do for you and will help him to know you better. In most cases, matters referred to the Inspector General usually end up right back in the hands of the unit commander anyway. He is the one person who can normally correct conditions or circumstances which contributed to the situation which caused your problem in the first place. If, after presenting your problems to your unit commander, you do not consider his actions to be adequate, then you can and should present your problem to the Inspector General and request his assistance. If you feel that your problem is so sensitive that you do not want the unit commander to know about it then, of course, you may present your problem directly to the Inspector General for consideration. The Inspector General will inquire into the matter, and provide you with an appropriate reply about those matters which affect you personally. Currently there is a problem vital to the interests of every member of the United States Army. Some personnel do not take advantage of the command and Inspector General channels available to them. Instead, they present grievances and complaints directly to members of Congress and to the President of the United States. These actions result in a serious drain on the time and effort of persons charged with the tremendous burden of directing the government. Do you know what happens to these grievances and complaints - you guessed it - they end up back on the desk of your unit commander for resolution and the end result is the same as it would have been had you presented your problem to him in the first place. Except for one thing; there is a tremendous administrative burden which accompanies each complaint sent down from Congress or other higher authority. Wouldn't it be simpler, faster, and a lot less trouble for everyone if you presented your complaint to your unit commander in the first place. When you bypass the commander and the Inspector General, you delay the solution of your problems and cause unnecessary paperwork as. well. Under our democratic system of government you have the undeniable right and privilege to communicate directly with any member of our government. However, you will find that your problems can normally be solved more quickly and easily and with a great deal more efficiency if presented FIRST to your unit commander and SECOND to your local Inspector General if you are not satisfied with the results obtained by your unit commander. Contact the Inspector General at CU CHI 107. Send a letter or message to the Inspector General, 25th Inf Div (Local), APO 96225. 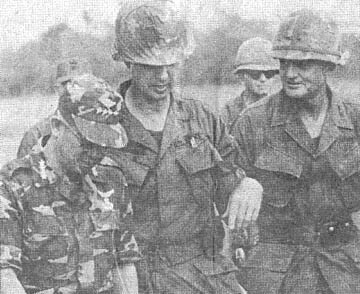 Ask your ISG or unit commander or fellow soldier to request that the Inspector General visit you in the field or at Cu Chi camp. Do not go AWOL to visit the Inspector General. Headquarters, 25th Inf Div Regulation 20-5 dated 9 April 1966 is permanently posted on your bulletin board and should be referred to for Inspector General visits. MACV (SAIGON) - The Military Airlift Command has announced that wives of military personnel planning to visit their husbands in Hawaii during R&R may take advantage of new reduced airfares effective June 24. The discount of approximately 25 per cent is on a economy (tourist) class tickets from the west coast to Hawaii. Flights will depart from Seattle-Tacoma, San Francisco and Los Angeles. Airlines offering the reduced fares are Pan American, United and Northwest. The reduced rates apply only to wives (not parents or dependent children) of men in Vietnam; on round trip tickets which are good for only 15 days from time of departure until time of return. Reservations may be obtained at any airline ticket office or JAMTO. Cost of the round-trip ticket will be $165.00. A MACV orders form similar to DD1580 will be overprinted on the reverse side and must be used. It will be available to individuals through component commands. The forms are authorized to be reproduced locally. The 1st Bn (Mech), 5th Inf has a new mascot at the Cu Chi base camp, as Gatito, a full-blooded Mexican bobcat, took over with a growl. He had just completed a trip half way around the world from El Paso, Tex., to his new "assignment" with the 25th Inf Div unit. Gatito was donated to the 2nd Bde unit by Roberto Cisneros of Juarez, Mexico. Cisneros contributed the cat after he saw a story in a local newspaper reporting that the battalion was looking for a mascot. 1SG Ignacio Medina of El Paso, a member of the mechanized unit, wrote to the mayor of the city asking if the city could supply a mascot. The local zoo superintendent suggested that the city was short of bobcats, but had plenty of rattlesnakes. He offered to send one to Vietnam if the battalion would change its nickname. 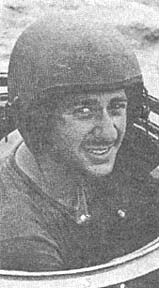 Before the idea could be sent to Vietnam, Cisneros volunteered Gatito. The cat had been a pet for his three children. Cisneros said that the children were sad to see the cat go, but that he was getting too big to keep. Two El Paso reporters traveled to Juarez to return the cat to El Paso for shipment. An article in the paper the following day described the major battle that occurred when the two tried to get Gatito into the traveling cage. After the trip to the El Paso zoo, where he received inoculations and a medical checkup, the bobcat was caged in a special shipping box. Employees of Pan American Airways sponsored his trip to Vietnam. 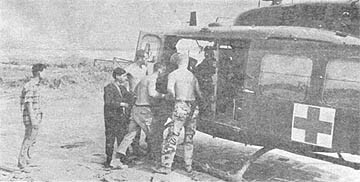 Twenty hours of jet flight brought Gatito to Saigon where 1LT Richard Ward, also of El Paso and the executive officer of the unit's headquarters company, met him. "The label on the box read 'Live Bobcat,' but no one believed it until they got next to it. Then they believed it," said Ward. "Every time we came near the crate, he hissed, growled and lunged. We weren't too sure of the screening at the end of the box." After a long growling trip, the soldiers arrived at Cu Chi where a new cage in the battalion area awaited the new mascot. The fearless soldiers opened the sliding door on the crate with a very long rope and Gatito was home. "We think he will be friendly after he quiets down from the trip," said Ward, "but right now he's just getting used to Vietnam rain and heat and he's pretty ferocious." 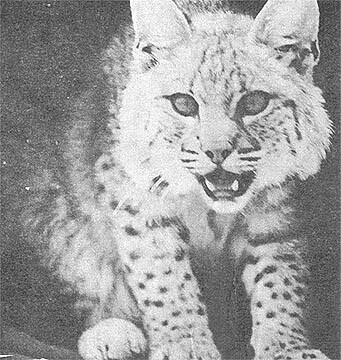 A BOBCATS' BOBCAT - Gatito is the new mascot of the 1st Bn (Mech), 5th Inf. From a Mister to a Sir in two easy steps. Take off the WO bars and pin on gold bars for a second lieutenant. Two men of the 25th Avn Bn recently did this exchanging their WO appointments for commissions. Co A "Little Bear" 2LT Douglas L. Eckart and 2LT William C. Bennett of Co B "Diamondheads" were the two pilots to pin on the gold bars. Eckart, 23, joined the 25th last January and Bennett came to the Tropic Lightning division last July. Bennett has the Air Medal with 16 Oak Leaf Clusters. The battalion' comnianoer, LTC William A. Beardon, gave the oath to the two men. Ed Note: The following item appeared in the Baltimore Sun and we felt it might be helpful for those planning an R&R after Sept 1st. The Australian tourist industry has begun preparations to handle a "dollar invasion" by thousands of battle-weary United States servicemen ready to go on the town with pockets full of dollars. Under present plans, United States military authorities intend to fly 12,000 troops a month from Vietnam starting Sept. 1 for rest and recreation in Australia. It is estimated the troops will boost the country's annual tourist income by as much as 50 per cent and with a resounding roar the word has gone out: "The Yanks are coming." A United States military team visited Australia recently to inspect amenities. Team members concentrated on Sydney, Australia's biggest city with a population of more than 2,500,000, and Queensland's Gold Coast, the nation's semi-tropical Florida-like playground. Both offer sun-drenched beaches, ample sporting facilities and a gay night life. Staying in hotels and motels, they will find a night life which ranges from exclusive restaurants, night clubs and discotheques to the shows of Sydney's Bohemian Kings Cross Quarter. During their inspection tour the United States Army team members said that experience has shown that each GI spends between $150 and $300 during a five-day "blow-out." There are seven men working at the Cu Chi base camp that could almost be considered "Good Humor Men." The men, headed by SSG Ronald Watkins, are from the 25th S&T Bn and man the ice cream plant. The plant was started in June 1966 and has put out more than 45,000 gallons of ice cream. All four two and a half gallon machines are put to work each morning to produce the ice cream. It usually takes about nine minutes to freeze a batch in the early hours of the day, but come afternoon the heat raises the production time to around 30 minutes. One good aspect of working in the plant is the sampling that takes place. Naturally the ice cream has to be tasted to make sure it is coming out right. DUC PHO - "I thought I'd had it when I saw him throw that grenade!" exclaimed CPT Kenneth Barton, commander of Co B, 1st Bn, 35th Inf. However, luck allowed Barton to walk away from the grenade explosion with only a small cut above his eyes while his web gear was ripped to shreds and his weapon smashed. Bravo company, part of the 3rd Bde Task Force, 25th Inf Div. was on a search and destroy mission northwest of Duc Pho when the patrol came under heavy enemy fire. As Barton maneuvered his company, one VC ran into a nearby bunker. Before Barton could reach it, the VC ran out and threw a grenade near the trio before being cut down. The explosion tore the captain's pistol belt in half, ripped open his ammo pouch and canteens and smashed the hand guard of his weapon. Topnotch tonsorial technology tucked away into two trailers is the timely topic of trimmed "Tropic Lightning" troopers. This tongue-twister describes the two new barber shops put into service this week by the Army and Air Force Exchange Service at the 25th Inf Div's base camp in Cu Chi. 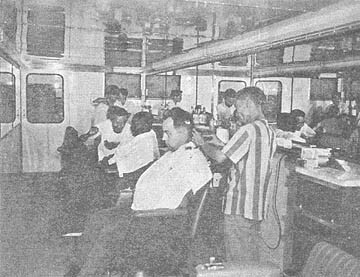 The five-chair barber shops are self-contained in air-conditioned vans having all the latest equipment to be found in stateside shops. Mirror-lined walls, electric clippers, hot water and upholstered chairs allow "Tropic Lightning" division soldiers a brief break from the heat and jungles in Vietnam. As one soldier was overheard saying, "Gosh, all this for 35 piastres?" It was 9:28 in the morning in the "dust-off" bunker in the 25th Med Bn area when the radio blared "Dust-off ... Dust-off." Three minutes later the chopper; with the red cross on the side, lifted off the pad, dipped its nose, cut a hard left and headed for the pick up spot. The pilot had been plotting the coordinates with the men in the bunker while the crew fired up the "life saver." Minutes later the pilot spiraled the ship sharply down to pick up a wounded ARVN soldier. He had received grenade fragments in the lower extremities and needed emergency treatment he couldn't receive in the field. On the way to the 12th Evac Hosp the radio crackled as the call came in concerning another dust-off near Tay Ninh. The average number of dust-offs during daylight hours is five or six for the Cu Chi facility. Night pickups vary from zero to 15 on a bad night. A crew chief supervises the ship with the pilot as the medic takes care of the patient. Several litters are carried in the chopper along with medical supplies and a hoist in case the craft can't land for the pickup. Different units have the 25th Inf. Div beat. The unit generally stays two days in Cu Chi working the area. A new team then comes in and takes over for 48 hours. "Dust-Off" has been credited with saving hundreds of lives by speeding wounded men to hospital facilities. Many of these men would have died, as they did in earlier wars, if it were not for these life saving machines and their crews. 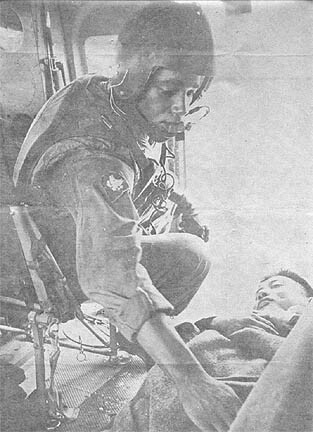 TAKE IT EASY SOLDIER - The airborne medic straightens the blanket and gives an encouraging word to the wounded ARVN soldier on the way to 12th Evac Hospital. READY FOR LIFTOFF - The medic and the crew jump aboard the chopper to head for the pick up spot. Many times these missions are flown at night. INTO THE LIFE SAVER - When the wounded man is loaded into the chopper the mission is half way over. 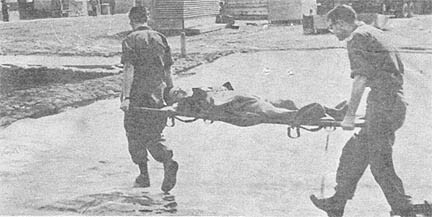 MEDICAL CARE IS STEPS AWAY - Medics from the Cu Chi hospital unload the patient. The chopper then lifted off and headed for Tay Ninh for another "Dust Off." THE LAST MOVE - The patient is taken to the hospital facilities as the dust off ship prepares to take off. The Cu Chi post exchange has taken on the look of a stateside department store since the completion of its expansion program. The recent addition of 3000 square feet of floor space to the 25th Inf Div's base camp PX has doubled the retail sales area, according to exchange officer MAJ William Finnigan of Petersburg, Va. The Cu Chi exchange is presently fourth in volume sales among PXs in the Saigon area, and according to Finnigan, the expansion is expected to increase that volume even more. He attributed a large new variety of radios, stereos, cameras and portable refrigerators for the additional dollar sales. DAU TIENG - Sweeping northwest of their base camp on Operation "Diamond Head," elements of the 3rd Bde, 4th Inf Div, engaged an enemy patrol on two succeeding days, resulting in one detained and three dead VC. The first day the 2nd Bn (Mech), 22nd Inf, was sweeping their assigned sector. At noon the men set their armored personnel carriers near a trail and set an ambush of opportunity. A short time later four uniformed Viet Cong were seen walking down the trail. SP4 Terry Humper of Saginaw, Mich., said, "We had them dead to rights. But just then one of our mascots, a spotted black dog, smelled them and started barking." The VC, about 75 meters away, jumped off the trail and started to flee, but some fast maneuvering resulted in the capture of one of the enemy. Blacky, the dog, had in the past, saved members of an American patrol from ambush, so he got off with a light reprimand. The next day, Co B, 4th Bn, 23rd Inf, set a 23-man ambush patrol near the previous nights battalion perimeter. The battalion had stayed in an open field about one half mile wide and one mile long. At first light, the APC's maneuvered through the surrounding tree lines, and thickets. Anyone spying would have thought that they were conducting the normal search around base camp, prior to moving out. But in one of these thickets, the APC's stopped for a minute. Immediately the patrol, led by 1LT Paul Lockard of Albany, Ga., leaped from their cramped quarters inside the vehicle and blended in with the jungle growth. Soft hats and camouflage faces decreased the chances of being spotted. The "stay behind" ambush patrol had been designed to stop anyone attempting to secure the laager area for usable material. About thirty minutes after the "Triple Deuces" had moved, three NVA troops walked into the field. Their path took them to within 150 yards of the treeline ambush. When they passed through the optimum kill zone, the patrol opened up. They didn't have a chance. After a short fire fight, the men came on line and, through fire and maneuver, worked themselves up to the enemy. The total for the two day action was one NVA detained, three dead and four weapons with web gear. There were no US casualties. At the battalion command post, on the first day, the prisoner had acted as if his capture was just about the unluckiest thing to have ever happened to him. He didn't know how lucky he was. He could have walked that open field the next day. SAIGON (MACV) - Penang health officials have on record 19 cases of R&R visitors who arrived with outdated Cholera shots since April. Though officials have been lenient up to now, continued violations are now causing "grave concern," according to the Embassy. Cholera immunizations must have been administered at least six days prior to arrival, in Penang, and may not be more than six months old. To avoid the possibility of spending five days and nights in quarantine all personnel are advised to check their own shot records well in advance when planning R&R. Remember, cholera shots must be administered at least six days before departure. DUC PHO - The enemy's first mistake was firing at the armored personnel carriers. Returning the fire, the 2nd Plt, Trp C, 3rd Sqdn, 4th Cav attached to the 3rd Bde Task Force, 25th Inf Div, instantly killed two Viet Cong and wounded another. The VC made a quick retreat into the small hamlet of Ban An. Chasing the running enemy, CPT Ronald W. Penn, troop commander, directed his men to search the hamlet. It was a surprise when the search produced something other than hiding enemy. Almost all of the mud buildings concealed a textile machine. Twenty-nine mechanical looms in all. 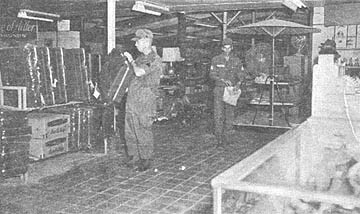 After receiving the report of the large find, LTC Clinton E. Granger, commander of the 2nd Bn, 35th Inf, requested a Chinook helicopter to evacuate the machinery. The looms were taken by the 3rd Brigade Task Force troops to district headquarters for later distribution to the villagers of Duc Pho. Confiscation of the machinery not only will prevent VC in Duc Pho District from getting new issues of combat uniforms, but also will provide a new industry for the friendly Duc Pho villagers. DAU TIENG - It takes an original idea to decorate a company mess hall, but Co C, 2nd Bn (Mech), 22nd Inf, has proven themselves equal to the task. Their walls are ablaze with over 40 flags donated by the various state legislatures. SP4 John Conat of Kellog, Idaho, started the ball rolling one day when he wrote to every state governor and requested a state flag for use by the company. One week later the replies started. With the exception of a few states, who do not have the money set aside to provide flags, every state has answered the request. As an example, the Governor and Mr. Wallace of Alabama, sent their greetings, and thanked the men for their contribution in preserving freedom around the world. They made known their support and the support of the people of the state of Alabama for the men fighting over here, and sent a three by five foot silk state flag. The once treacherous roads between Cu Chi and Bao Trai, southwest of the 25th Inf Div base camp, are free from Viet Cong mines. The 1st Bn (Mech), 5th Inf "Bobcats" intend to keep it that way. The battalion is playing a major role in the 2nd Bde Operation "Kolekole" with "Roadrunner" missions that keep the roads open. One of the many objectives of the wide-ranging Kolekole is improvement of Hau Nghia Province road systems. The goal is to make rapid transportation between major villages a reality. Heavily armed personnel carriers rumble through high speed runs down the route day and night. The four-vehicle patrols are irregularly spaced to discourage ambush. Mechanical trouble is one of the biggest problems the unit meets. The high speed runs take its toll in machinery. A complete combat maintenance section in the forward base camp keeps the roving patrols on the move. Roadrunner allows massive quantities of supplies and road building material to travel by direct route to combat troops and construction sites. The route, once controlled by the Viet Cong, now provides a secure link in the Allied mission in Hau Nghia Province. MAJ Danny L. Romig, operations officer of Co A, 25th Avn Bn, was recently awarded the Silver Star by MG John C. F. Tillson III, 25th division commanding general. Romig was decorated for his action March 18 while under intense fire on a mission to extract an element of the 2nd Bn, 27th Inf, "Wolfhounds." Romig was the flight leader of eight "Little Bear" choppers and while picking up a load of men with his ship, he directed the movements of the other ships. "The first time I have seen a doctor since 1940," said spry old Mr. Nguyen Van Tri, 86, who was recently treated during a medical civic action program in a small hamlet near Trang Bang in Trang Bang District, Tay Ninh Province. 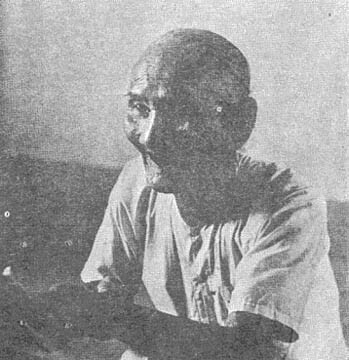 This old man was only one of some 200 people treated during the MEDCAP which was conducted by four ARVN medics working with a MACV adviser and a doctor and medics from the 25th Inf Div, 4th Bn, 23rd Inf. This new joint civic action program will eventually reach all the hamlets and villages in Trang Bang District. The purpose of the joint operation is to give treatment to all who need it and at the same time train ARVN and local forces to the point where they will be able to continue the program after the Americans leave the area. Currently the villagers have little or no regular medical treatment facilities of their own so the MEDCAP are considered a Godsend. A week after his initial visit Mr. Van Tri was seen at another MEDCAP apparently trying to make up for lost time. AW, COME ON DOC - (Above, right) Tearfully a small baby huddles close to his father as an Army medic administers first aid on a head laceration. NIGH ON THIRTY YEARS - Nguyen Van Tri gives a grateful smile as he receives medicine. He had not seen a doctor since 1940. DAU TIENG - "I was walking point," said PFC John E. Maartense, "and there were some bushes on the left about 15 meters away. VC opened up on us and I turned just in time to see a Viet Cong point his weapon straight at me and shoot." Maartense from Hayward, Calif., was point man for a 15-man patrol from Co C, 2nd Bn (Mech), 22nd Inf. The Ivymen were probing the jungle. "The next thing I remembered was being sprawled on the ground with a ringing in my head," said Maartense. When Maartense came to his senses and picked up his helmet, there was a big hole in the middle. The helmet had deflected the bullet so that it had just creased his head and momentarily knocked him out. Talking about the patrol back at the company perimeter, patrol leader Sgt George T. Dahl of Minneapolis, Minn., said, "You have to be quick over here. This time the enemy was quicker -we were very lucky." But Maartense was not in so philosophical a mood. "I'm just happy to be alive." Three men at the Cu Chi base camp just "cool it." That is their only job, but it is one that is most appreciated by the rest of the "Tropic Lightning" soldiers. SP4 Alvin O. Buechel and PFC Richard E. Joronen, both of Co A, 25th S&T Bn, work with Jack Van Vianen of Pacific Architects and Engineers (PA&E) manning the two ice plants. The two plants have an output of 200 blocks of ice every day. Each block weighs about 300 pounds. The giant ammonia refrigerators have 91 freezer units in each plant and it takes approximately 40 hours for each unit to freeze one block of ice. Buechel and Joronen are responsible for issuing the ice to the different units. The heyday of ice man is gone in the states and the possibility of these men making a career of cooling it is slim, but they continue to keep the men of the 25th Inf Div happy. "Driving an APC can be fun but it can also be very dangerous," remarked SP4 David Berti from San Francisco, Calif.
Berti, a member of Co C, 1st Bn (Mech), 5th Inf, has been driving the Armored Personnel Carrier for most of his tour in Viet Nam. He has five months remaining. Berti began driving when there was a need for a driver. "I just jumped down in the hole and began driving," explained Berti. "There really isn't much to it." Maintaining his APC is also a requirement for the driver. "It's pretty rough keeping the APC in good shape. Especially in the rugged terrain that the Mech has fought in," said Berti. DUC PHO - "It was Denino's French that helped us find the VC hideout," said 2LT Michael J. Pulaski as he unfolded the story of the night and day battle. Co A, 2nd Bn, 35th Inf, fought what was estimated to be at least a reinforced company of Viet Cong. Earlier on the previous day, 1LT John Denino led his platoon on a sweep through a small hamlet where he interrogated a French-speaking Vietnamese. The men of the 3rd Bde, 25th Inf Div, learned that a large force of VC were hiding in the hamlet of Thiet Truong, just a few hundred meters away. "I set out my listening post at 11:30, and about an hour later we were hit by about a dozen Cong. We fought them off and then relocated our landing zone." It was shortly after one in the morning when they hit again. This time it was really heavy. The enemy came as close as 20 to 25 meters and hit with hand grenades, recoilless rifles and automatic weapons. "For the next three and a half hours," Pulaski continued, "we blew our Claymore mines, hurled grenades and emptied magazines of ammo to fight off the enemy. "With both medics wounded, SP4 Wesley Fox, a forward observer, took over as medic. It wasn't until four o'clock that morning that the cavalry arrived with their armored personnel carriers to secure the LZ. "We really had the VC on the run when the artillery, air strikes and gun ships swarmed in on his position. Fighting continued throughout the day and we killed 76 VC and captured 22 weapons. "All my men did a great job. PFC William Davis, an RTO, knew that his commo was useless at this point, so he began distributing ammunition. "There was SP4 Bobby Day, a rifleman, who took over as machine gunner under intense enemy fire. "May 20 will long be remembered by all of us. I'm proud of the job done by these "Gaotimen," Pulaski concluded. DAU TIENG - Reacting to intelligence concerning Viet Cong activity in and around the area of Village number 3 situated in the Ben Cui Rubber Plantation near Dau Tieng, the Army's 2nd Bn, 12th Inf Command Group, along with several Vietnamese National Police, conducted a search of the village at dawn. While Co B, 2/12th, and an element of the 3rd Bn, 22nd Inf provided the security cordon, five teams of searchers, with at least two Vietnamese nationals each, conducted a thorough and detailed search of each individual "hooch" in an attempt to locate the Viet Cong or indications of their activity. The search netted one Viet Cong. Discovering the man's name on a list of Vietnamese with Viet Cong loyalties, the 3rd Bde, 4th Inf Div. 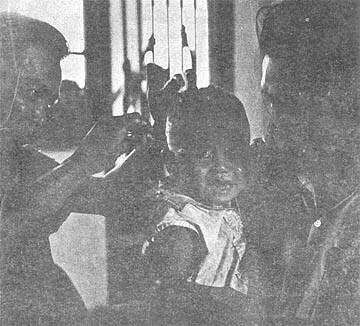 troops with the aid of ARVN troops immediately commenced interrogation. The questioning confirmed suspicions. He was, in fact, a Viet Cong. The man is now in the custody of the proper Vietnamese authorities for additional questioning. 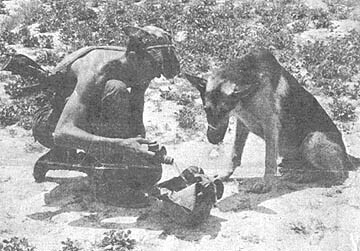 Utilizing a pair of scout dogs in the search party, the teams were able to easily check underground storage areas and other unattainable places. Several underground storage areas of considerable size were discovered and thoroughly searched. When every conceivable "nook and cranny" of the village had been gone over, the search teams gave way to CPT F. Jay Pepper, battalion surgeon, and his team of medics who followed with a MEDCAP. Hundreds of villagers sought medical attention, and a variety of medicine was administered. With all medical supplies expended, the Ivymen returned to Dau Tieng. This particular type of operation accomplishes a two-fold purpose: it fully demonstrates that the United States means business with the Viet Cong, and it improves relations with the people by means of a MEDCAP. DUC PHO - It was the "Blue Team," a platoon of air cavalrymen, from the 1st Sqdn, 9th Air Cav, who first collided with units of an estimated NVA battalion. They had been inserted shortly after noon to check out a suspected enemy position. The choppers had barely lifted off when they were hit from all directions. 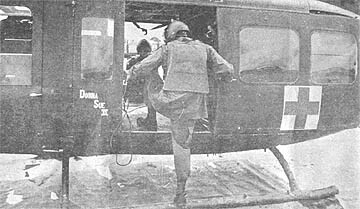 The "Blues" held their own but were running low on ammo and being pressed by the NVA when the 1st Plt, Co B, 2nd Bn, 35th Inf, was airlifted into the battle. "As we approached the landing zone I could see it was plenty hot," said 2LT Walter Twyford, the platoon leader. "My chopper was hit and missed the LZ by 200 meters. We were all able to make it in and link up with the fighting cavalrymen though." The bitter fighting continued and an attempt to overrun the American positions was repelled before more help arrived. The remainder of Co B and the 2/35th's recon platoon joined the fighting along with two platoons of armored personnel carriers from the 3rd Sqdn, 4th Cav. With the APC's and infantrymen battling side-by-side, the NVA lines were shattered. "We really had the VC on the run," said Twyford. "Forced from the trenches he couldn't find enough holes to hide in. As we moved through the area we started receiving fire from the rear. Many were in spider holes and we had to sweep back through the area." Darkness fell and contact continued throughout the night. 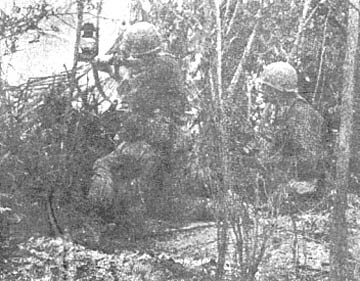 The infantrymen of the 3rd Bde, 25th Inf Div, now had a new danger to contend with as the NVA began firing mortar and recoilless rifle rounds into the perimeter. "When the mortar rounds began to fall I was too busy to be scared," said SGT Kenneth J. Hills of the 3/4 Cav. Hills had fired 50-60 magazines of M-16 rounds, a case of M-79 grenades, and 3000 rounds of 50-caliber machine gun ammo. Aided by air strikes, artillery and "Spooky," the "Cacti" and 3/4 Cav routed the NVA. A search of the battlefield the next day turned up 87 Communists killed by body count and numerous weapons including a 60mm mortar, recoilless rifle and machine gun. Fighting from heavily fortified VC bunkers, SSG George D. Taylor of Columbia, S.C., and his ambush patrol from Co C of the "Golden Dragons" were able to ambush a patrol of well armed and disciplined VC. After allowing the point man to pass, Taylor let the second man have it with the blast of a claymore mine. Other men on the ambush opened up with M-16 and M-79 fire which killed the squad leader. Two other VC were seen to have dropped. Very quickly the VC broke contact only to return two hours later to try to reclaim their dead comrades and lost weapons. But they were unsuccessful because the bunkers that the VC had built were too strong to be taken. It was ironical that the enemy was defeated by something that he himself had built. There were no American casualties, and a Russian assault rifle and a Chinese Communist anti-tank weapon were captured. Two VC bodies were found. Other VC on the patrol were seen to have been hit indicating other enemy casualties. While the "Untouchables" may yet be touched, there doesn't appear to be much possibility of them being beaten in the near future. The "Untouchables" are a softball team composed of clerks, medics, officers, mechanics, and assorted aficionados representing the Hqs and Svc Btry, 3rd Bn, 13th Arty. The 25th Inf Div team has issued a standing challenge to play any team, any time, any place. In their last game the "Untouchables" topped the officers of the 2nd Bn, 14th Inf, by a score of 7-0. The team coach, SP4 Richard Kocsis of Staten Island, N.Y., had this to say about the game. "They had everyone from a MAJ to a 2LT playing on that team, but the bat boy was a PFC." The winning pitcher was 1SG Roy J. Rapavi of Adena, Ohio. Rapavi struck out 18 of the 21 batters he faced. He occasionally pitched a ball over the backstop, just to keep the game interesting. With his formidable record as a semi-pro and experience on the All-Army team, his teammates consider him one of the best pitchers in the country. The aerial assault choppers pounded to the ground and soldiers of Co B, 1st Bn, 27th Inf "Wolfhounds," splashed to the muddy earth. 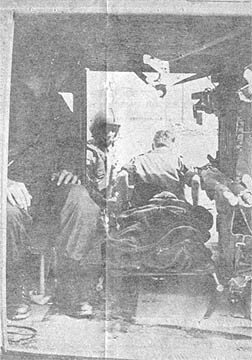 One infantryman was wounded by sniper fire and his buddies covered the "Dust Off" helicopter with heavy fire as it flew him out. "I placed the company on line after the ship took off," said Company Commander CPT Larry Garlock of Cleveland, Ohio, "and we began sweeping toward the sniper's positions." After a few hundred yards of the sweep, the company's 1st Plt engaged the enemy. The Wolfhound infantrymen moved ahead and discovered one dead Viet Cong and evidence of others who had fled. The dead man carried five pounds of documents describing Viet Cong operations along the Oriental River near Duc Hoa. One more VC was killed by the company as they spotted him attempting to swim the winding river.